Panoramic Views of the Pacific! 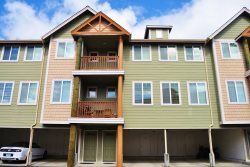 The Shoreline Beach House at Heceta Beach is a fantastic 4 Bedroom, 4 Bath Beach House right on the sand and surf that comfortably sleeps a family or group of 8 people. With two levels of panoramic windows looking out over miles of pristine beaches found nowhere else in the Great Northwest, the Shoreline Beach House is the perfect vacation getaway that you have been looking for! Just walk out your door to some of the most gorgeous beaches and magnificent sunsets of orange, gold and pink right on the Florence Oregon Coast! This outstanding 2-story home comes complete with just about all of the amenities and appointments that you will need for your stay. If you don’t feel like cooking, the Shoreline Beach House is just a short stroll from Surfside Restaurant at the Driftwood Shores Resort. The Shoreline Beach House is located on Heceta Beach, this one-of-a-kind coastline offers miles and miles of pristine beaches as far as the eye can see. For those who love the sand, bring your quads and ATVs to the sand dunes just a couple minutes south of town. Visit Old Town Florence and explore the wonderful bistros, restaurants, galleries, and shops along Bay Street. Just a few minutes north along the coast and you’ll find the world famous and often photographed Heceta Head Lighthouse as well as Sea Lion Caves! For the avid fisherman, bring your boats and watercraft and test your skills on one of the 27 lakes in the Florence area sporting some of the best trophy bass. Still trying to land that trophy steelhead, well don’t forget salmon season on the Siuslaw River. Room for at least 6 vehicles with plenty of room to turn around. Slight Uphill gravel road driveway!